This image taken by the Robotic Arm Camera on NASA's Phoenix Mars Lander shows the lander's Thermal and Electrical Conductivity Probe (TECP) near the Martian surface on Sol 43, the 43rd Martian day after landing (July 8, 2008). NASA'sPhoenix Mars Lander has stuck a fork in Martian dirt for the first time. 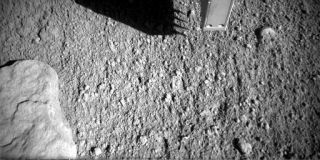 Thespacecraft also has begun to use a microscope that can determine the shape oftiny particles in the dirt. Theactivities, initiated on Tuesday, allowed mission scientists to test theprocedure for using Phoenix's robotic arm to stickthe four spikes of the probe into undisturbed dirt on the planet's surface. The prongsof the instrument, called a thermal and electrical conductivity probe, areabout half an inch (1.5 centimeters) long. Scientists can use the instrument toassess how easily heat and electricity move through the Martian regolith, providinginformation about frozen or unfrozen water in the dirt. The probesits on a "knuckle" of the 7.7-foot-long (2.35-meter) robotic arm.The arm can also hold the probe up in the air to take measurements of watervapor in the atmosphere. The probe has been used to take these atmospheric measurementsseveral times since Phoenix's May 25 landing in the Vastitas Borealis plains offar-northern Mars. Missionscientists planned to tell Phoenix to insert the probe into the ground againand then proceed to take its first measurements on Thursday. As for theatomic force microscope, after making its first touch test Tuesday, Phoenix took its firstimage from the instrument Wednesday. The atomicforce microscope builds an image of the shape of the surface of a particle byrunning a sharp tip mounted on the end of a spring up and down across thecontours of the surface. It can provide details as small as about 100nanometers, less than one-hundredth the width of a human hair. The firsttest of the atomic force microscope involved running the tip along one of thesubstrates on the microscopy station's sample-presentation wheel to test outthe instrument. The substrates will be used to hold soil particles in place infuture tests. "Thesame day we first touched a target with the thermal and electrical conductivityprobe, we first touched another target with a needle about three orders ofmagnitude smaller ? one of the tips of our atomic force microscope," saidMichael Hecht of NASA's Jet Propulsion Laboratory in Pasadena, Calif. Hecht isthe lead scientist for the suite of instruments that include both the probe andthe microscopy station. The imagingshowed a grooved substrate that will be used to calibrate future images. "It'sjust amazing when you think that the entire area in this image fits on aneyelash," Hecht said. "I'm looking forward to exciting things tocome." With thesetwo latest developments, Phoenix has now used all the capabilities of itsMicroscopy, Electrochemistry and Conductivity Analyzer (MECA) suite ofinstruments. This week Phoenix also began analyzing the seconddirt sample to go into MECA's wet chemistry laboratory, which can detectsoluble minerals in the dirt. The Phoenix team has also been looking for the best method to gather a sample of ice todeliver to the lander's Thermal and Evolved-Gas Analyzer (TEGA), which bakessamples of surface material and analyzes the vapors given off to determine thecomposition of the samples. Phoenix has already used its rasp to scrapoff pieces of ice from the hard subsurface ice layer.